I wanted to share a sword I have been working on lately. 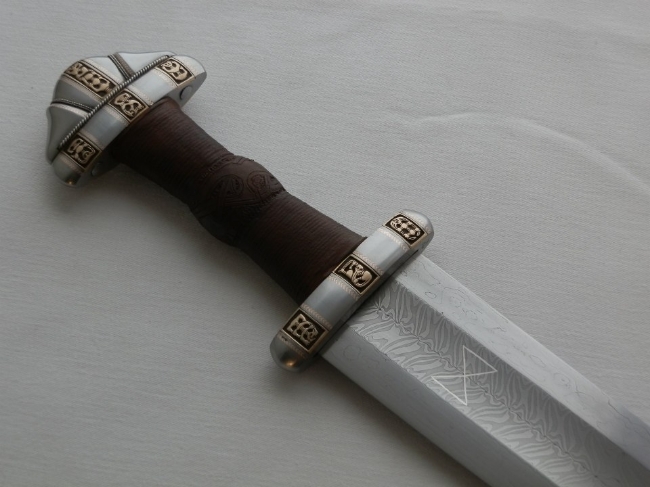 This is an inspired reproduction on the Steinvik sword. It has been a dream of mine to reproduce this sword since the day I first saw it and I am grateful for the opportunity. The repro varies from the original somewhat as I was given very direct instructions and measurements by my client. The width and length vary slightly from the original as does the lack of silver inlay. The measurment changes have made for a very pleasant feeling sword in balance and weight. The POB is 12 cm from cross and the weight is almost exactly 2 lbs 8 oz. . OAL is 92 cm. If anyone is interested there are more shots on my facebook work page. I've been watching this on your FB page. I have to say, Jeff, I think this is your best work yet. And that's saying something! Absolutely a piece of art at every level, from the inlays to the overall shape and proportion. Truly a magnificent piece! I too saw this on your Facebook page and was and am blown away at ALL the details. The hilt details are astonishing. This is one beautiful sword. Fantastic accomplishment. Absolutely a beautiful creation. I am sure the owner is one happy camper. Holy smoke! That is just plain gorgeous! Really great stuff Jeff! Amazing work Jeff! The rate of your artistic growth is astounding. The original is my favorite Viking sword, for its size, perfect proportions, and unique decoration. Truly a King's sword! You really need to be confident in your craft to seriously take this one on. I was thinking for quite a while you'd be the guy to do it if I was ever in a position to fund something like this. Interesting to see that two Masters from two different continents decided to take on this sword at about the same time, resulting in two quite different swords. Beautifull work again,Jeff.Steinsvik is one of my favourites. Thank you everyone, I really appreciate your comments. I really enjoyed making this sword and I would actually be tempted to revisit this again at some point , the original is such an interesting piece. Perhaps if I ever make a trip to go see it some time. 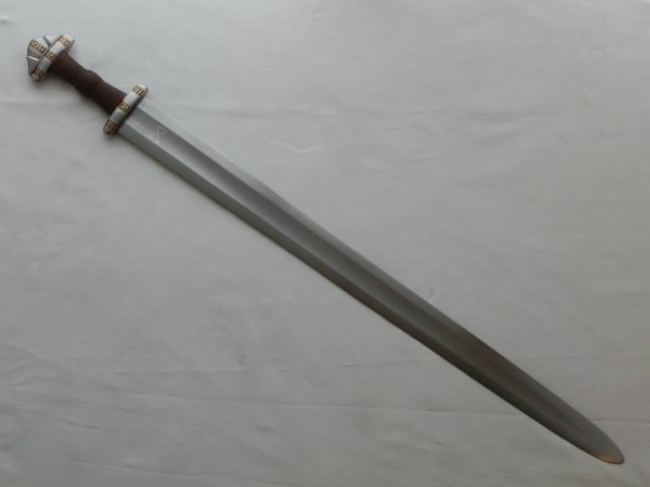 This is by far the best Viking sword the one that I would like to have had reproduced but not for an few more years yet as I have an other reproduction in the works. I have been thinking what to say about this one, I think Peter has summed it up, I agree with him. I particularly love the handle details. you are managing to make pieces that seem to "exist" rather than look to be made. Yup, I can't say it better than Peter.